My idea was to have John, his wife Belinda and their children Imogen and Isabella come to our studio and have a bit of fun using scrap glass to design up a coaster each. This way they ended up with a set of fused glass coasters that they would have for life and a memory to share. To prepare, I cut up 100mm square base plates out of clear Bullseye glass, and then laid out my scrap glass in colour groups. I store scrap glass in colour groups inside disposaable food containers so I just had to set them up on my workbench and away we went. 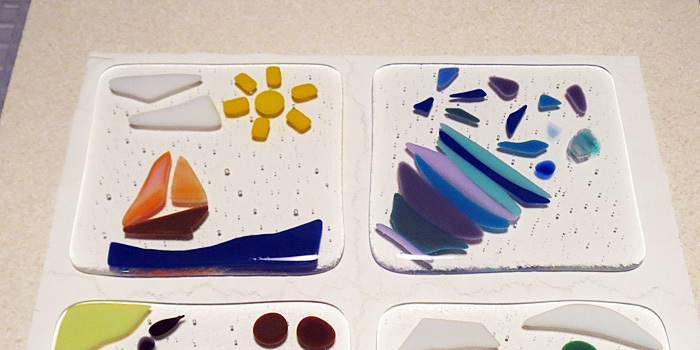 They were each assigned a base piece and given a safety warning about working with glass. The instructions were to simply use their imagination and design anything they desired. I would do any cutting required. In this photo you can see the result before firing. Top left was Johns design, top right Belindas, bottom left Imogens and next Isabellas. These were then fired using the firing schedule below. I did crash cool step 3 (opened the kiln door slightly) to get down through the devitrification range as quickly as possible. Fused glass coasters made by family members. In the end result you can see that while the designs were simply, the end result is fantastic, and the look on the girls faces when presented with the finished pieces was priceless. This is a great way to spend some quality time with family and friends and I urge all fusers that if you haven’t done anything like this yet, give it a go. You will love the interaction and the end result really isn’t all that important. Just enjoy the moment. Did you use a double layer of clear glass as the base? Yes, two 3 mm layers. One layer wouldn’t have given a very flat result. As you are obviously considering that is important for coasters. The two layers worked reasonably well. The deco fused down without losing too much of the design.